This is such a lovely way to display food cones. An Oblong Bamboo cone stand is equipped with 20 slots so you can easily a put twenty of your cones in one of these lovely stands. In addition, this stand measures 22.5 inches in length x 4.125 inches in height x 4.5 inches in width, which means you can put it in a variety of locations. An oblong bamboo cone stand is also made of environmentally friendly bamboo thus you can feel good about using a stand that is good for the environment. Use this bamboo cone stand to finish of your food cone presentation. Another popular bamboo cone stand that many chefs rely on is a 36 slot cone stand, it measures 13.5 inches in length x 4.26 inches in height x 12.25 inches in width. 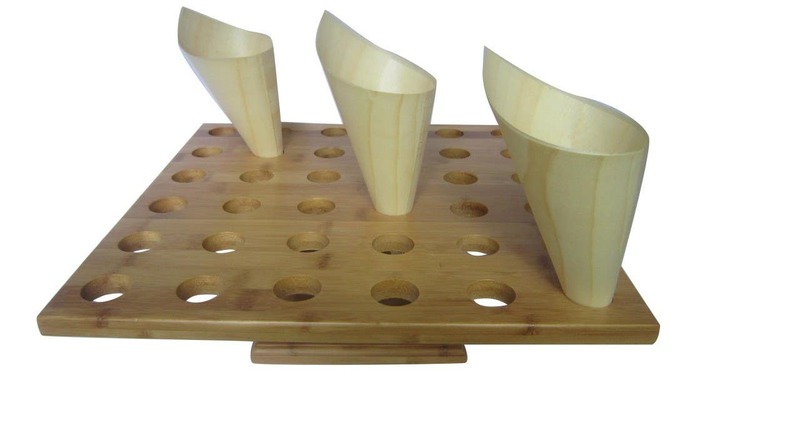 This modern food cone stand can be purchased in the form of bamboo, acrylic or pinewood. It is durable and sturdy, but you should know that food cones like pidy waffle cones are not wide enough to fit the base of this stand. However, other types of food cones fit and look awesome in it. Any kind of bamboo cone stand can help you create the ultimate food display, they finish off a food cone display perfectly. Plus, they keep your cones secure and safe, which means you don’t have to worry so much about your cones falling all over tables and onto the floor. Surely you should give them a try, let these modern stands help you create a state-of-the-art culinary masterpiece.